I have not always painted in oils. I originally started painting in acrylics at fifteen. Later when I was hired for my first job in the entertainment industry as a background artist, I continued to paint with acrylics. It wasn’t until I decided to make the jump to gallery painting that I switched over to oils and before I did I researched the proper use for oil paint and read up on materials and techniques. I talked to a conservator and asked about proper technique to ensure long life for my paintings. We talked about what to paint on and about sizing and grounds and pigment layers. Basically the paintings that have the best chance of survival are ones that follow certain rules to insure anatomical strength for the physical painting. Paintings on hard surfaces have less chance of cracking than paintings on stretched surfaces. if you don’t use linen or cotton the surface must be prepared with a ground to hold the paint. If the surface is wood it must be completely dried to prevent warping and flexing as it dries. Kiln dried wood is best for painting. Gesso and oil prime are what most people use as a ground today. 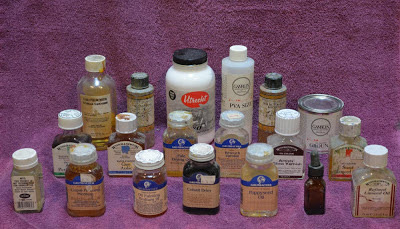 If painting on linen or cotton the fabric must first be sized or sealed to prevent rotting or allowing moisture to invade the layers of pigment. Animal glue was the preferred size for years but that has now given way to polymer sizes made with PVA. Oil prime was originally lead carbonate pigment mixed with turpentine this has been replaced with titanium white for safety reasons. Lead white is more expensive and carcinogenic than other whites and has fallen out of use as a commercial ground and as a paint for application although it can still be purchased. After the ground applying the pigments should follow the fat over lean rule where layers of applied paint contain more oil in the later stages. Thinning your paint with medium or solvents breaks down the paint and makes it more prone to flaking and cracking. I was told the impressionist paintings were the easiest to preserve because the paintings were layered very simply. They usually contain a size and ground for the canvas and then pigments were applied and then a varnish was added. I have followed this advice for my career using oils and I have not run into any problems of permanence. This is a different approach than more academic paintings which could have layers upon layers of pigments and glazes with different types of mediums and extenders to retard or quicken drying times for the paint. This latter type of painting has a greater chance of problems for permanence s as the painting ages. Extra care must be taken to insure the stages are preserved correctly when drying so the pigment doesn’t delaminate or crack over time. This includes using liquin which has become a popular commercial medium and homemade mediums of various mixtures and consistencies. A trip to the museum will show the veracity of this advice. Paintings on stretched surfaces and paintings that have many layers of pigment and glazes show a tendency to crack and come apart even in as few as fifty years. This is especially true of the modern art movement where some painters introduced fugitive substance into their work that destroyed the integrity of the pieces and created a nightmare for restorers. Other paintings like some orthodox Russian Icon paintings on oak panels or copper look as fresh as the day they were painted. Very interesting post. I have always loved the look and texture of oils, but have been terrified of them because of all of these different things to use and because of the expense, makes things seem more important! Thanks for the post, Armand. That information was helpful. I paint on hardboard and love to paint on firm surfaces. Your landscapes are very good. I enjoyed stopping by and taking a look. Of course with the skill and quality of craft you have, you don't need a nobody like me telling you that. I can only hope to become as capable as you. I keep practicing just about everyday and need to work even harder at it. God bless my friend. Keep up the informative posts and many successes to you!